Here’s a useful tip if you’ve ever tried performing a remote reboot of a server or workstation running Windows and had the reboot get hung up. Of course, you need to be running as a user with admin rights on the remote machine. Typically, I would follow this with a ping -i computername to confirm the remote machine has rebooted. Normally, after a minute or two, you’ll see the machine stop responding to ping, and then eventually come back online. Occasionally, though, if the remote machine is having issues, the reboot can get hung up. If you try the command again, you will get the error: A system shutdown is in progress.(1115). What now? Well, you can try cancelling the reboot with shutdown /a /m \\computername and initiate it again. You might try adding the /f switch to the shutdown /r command, which forces all running applications to exit rather than allowing them to save their data. But what if that doesn’t work either? Note that this is nearly the equivalent of pulling the plug on the machine. I wouldn’t recommend using it unless a regular reboot has failed. And of course if the machine isn’t responding to RPC, then nothing is going to work and you’ll just have to walk over there and mash that power button. Was this helpful? Know of a better way? Leave a comment and let me know! It links to a white paper titled “If You Want To Protect Your Privacy, Secure Your Gmail”. It’s a guide about setting up the FireGPG Firefox extension, or using Thunderbird with Enigmail, right? Well, no. The paper, apparently co-authored by Google Canada and the Information and Privacy Commissioner of Ontario, explains how to connect to Gmail using an SSL-encrypted connection. This of course is to “encrypting your Gmail” what locking your mailbox is to writing your secret love letters on postcards. As if the public wasn’t confused and uninformed enough about security and privacy issues relating to email, we now have big companies and government agencies muddying the waters. There is a big difference between “encrypting your Gmail” and “encrypting your connection to Gmail’s servers”, and the paper doesn’t make that distinction clear. If you *really* want to encrypt your email, check out this Instructables article. Update 2009-08-22: Two new(ish) changes to report! The first is that with the release of iPhone OS 3.0, it is now possible to subscribe to Internet calendars directly from the device. The second is that NuevaSync now offers a premium service which includes push e-mail and up to 50 calendars. I’ve updated my post accordingly. Update 2009-02-26: I’ve added the steps to set up synchronization using Google Sync to the post. Update 2009-02-14: Google now provides wireless synchronization capability directly. The instructions for setting it up are here. I’ve been using a great free service called NuevaSync to wirelessly synchronize my Google calendar and contacts with my iPhone. It’s essentially a proxy to Google’s contacts and calendar services that allows you to synchronize them with any device that supports the Microsoft ActiveSync protocol, including the iPhone and Windows Mobile devices. When the service first launched, you could only synchronize with Google calendars which you had read/write access to. Recently, however, they have enabled syncing with read-only calendars. This includes services which publish an iCal feed which you have subscribed to in Google Calendar. And since Facebook Events provides an iCal feed, you can subscribe to it in Google Calendar and have the events show up in your iPhone calendar. 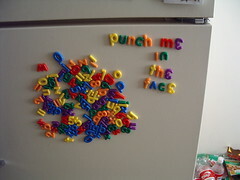 My Creative Commons–licensed Flickr photo of magnetic letters on my sister’s fridge spelling out “punch me in the face” (complete with upside-down 3’s for e’s) has been in use on the “Refrigerator magnet” Wikipedia article for 768 days. I had a dream last night that I got really drunk at a party, and that when I came to, I had two tattoos. One was on my right bicep, and it was a vertical series of strange graphics interspersed with words like “colour” and “fun”. On my left bicep was the logo for a ridiculously named metal band—”The Lysine Contingency” or something—written in a blackletter-style typeface. When I woke up I had to look at both arms, just to make sure that I hadn’t really gotten tattooed. And then I realized I had slept for eleven hours and that I was late for work. So I’m sitting here on my coffee break trying to figure out how to fit this all into a Twitter status update. Oh, hello, alternate reality self. What’s up? Hey Ryan, you have a blog and you never write in it. You could totally turn this into a blog entry. PS: I did a Google search, and of course there’s actually a metal band called The Lysine Contingency! Awesome! I’ve been using the twhirl client to connect to Twitter from my Windows Vista computer at work. It’s been great, except that links to web pages were opening in Internet Explorer rather than Firefox, which is my default browser. I had noticed the same behaviour in Pownce as well. Both of these applications are built on the Adobe Air runtime. Select Start > Default Programs > Set Program Access And Computer Defaults. Click Continue in the Security Alert dialog box, if it appears. Select Custom, and then select your preferred browser under Choose A Default Web Browser; click OK. The problem I had was that Firefox wasn’t showing up as one of the options under Choose A Default Web Browser. The fix for me was to download the Firefox installer and reinstall over top of my existing Firefox installation. After doing that, Firefox showed up in the list. I think the worst thing that could ever happen to me would be to go to the doctor and find out that I have a tumour the size of a baseball, because I hate baseball. On the road. Typing this on my laptop in the back seat of Allan’s Dodge Caravan, the cargo area packed to the roof with drums, amps, and guitars. Surrounded on all sides by the majestic Rocky Mountains. Taking the Canmore exit to pick up some breakfast before we head on to Calgary. Played the Rose and Crown in Banff last night to a mildly appreciative audience. Some drunk guy named Paul comes up to Josh between sets and asks if we know any Rolling Stones songs. â€œMy favourite is â€˜You Can’t Always Get What You Wantâ€™, man.â€ As it turns out, we actually do cover that song and itâ€™s in our second set. Just the latest in a series of strange coincidences that includes Josh summoning a police officer through sheer force of conjecture, finding a television show about the ability of elephants to detect subsonic vibrations with their feet after discussing that very thing that afternoon, and something else which I cannot recall at the moment. Anyways, just before we play the song, Jay asks me, â€œShould we invite Paul up to sing?â€ I reply in the negative; Jay invites him up anyways. Sometimes Jay is right. Paul canâ€™t sing worth a damn but his wild gesticulations are entertaining. As we are packing up our instruments, another inebriated patron — a cute girl there with her boyfriend — asks us if we could play a few more songs. â€œSorry,â€ I reply, â€œbut if you buy our album, you can listen to us play whenever you want.â€ â€œDonâ€™t be smart,â€ comes the boyfriendâ€™s retort. â€œNo, you know what? I am going to buy your album,â€ the girl declares. Sweet. Iâ€™m not above manipulating drunk women to further our bandâ€™s financial aims. â€œAll right, blow me,â€ Jay has just demanded. This is the routine we go through whenever Jay needs a smoke: his request is fulfilled by the driver turning on the blower and opening the vent. This combined with Jay opening the fold-out window in the sliding door helps keep smoke in the vehicle to a minimum. Back to last night. I walk over to the merch table to grab a CD. By the time I get back to the girl, â€œBreak On Throughâ€ by The Doors is playing, and sheâ€™s dancing with her boyfriend. Damn, cockblocked by Jim Morrison. We load up our gear and Allan, Josh and I head to the band house while Jay waits to get paid. When 3am rolls along and Jay still hasnâ€™t shown up, we launch a search party. Turns out that Jay was getting drunk(!) with the staff back at the pub. We did manage to sell a couple albums that night. Thatâ€™s two more than we sold the night before, when our audience numbered around ten patrons. Of course, it probably didnâ€™t help that we didnâ€™t bother to set out the merch. A sample of my witty on-stage banter that night: â€œYouâ€™ve heard of hotels with vibrating beds? Last night we stayed in a vibrating room.â€ It was kind of true; our suite at the Canyon Motor Inn in Revelstoke was directly above a noisy steam valve that sounded at regular intervals. Jay and I went for dinner at the restaurant in the nearby Best Western that night. My Mediterranean chicken was delicious, except they forgot the chicken. â€œMustâ€™ve flown away,â€ the waitress quipped. A small dish of sautÃ©ed chicken was eventually procured. No Jay Dunphy tour would be complete without the coining of numerous euphemisms. Trout figured heavily into last yearâ€™s lexicon. Some entries from the current tour glossary: baking a Walnut Crunch, dumping the puck in for Buffalo, riding the steel horse, the Bronx Johnny, visiting the hatchery (another trout reference sneaking its way in). Iâ€™ll leave their meanings up to your imagination. Our first two shows were a kind of exchange program with The Shine On from Vancouver. They opened for us at Steamers on Thursday, and we opened for them on Friday night at a coffee house/pub called CafÃ© deux Soleils in Vancouver. Good turnout and an appreciative audience at both. Lots of my friends came out to the Vancouver show which is always nice. Due to a miscommunication some of them missed most of our set, but câ€™est la Facebook. Big props to Jess and Rob for the burgers and corn that night. Weâ€™re in Calgary now, relaxing at Jayâ€™s sisterâ€™s place and stealing her neighbourâ€™s Internets. Tonight, we shall rock off the faces of all the good people at the Ironwood Stage and Grill. Tomorrow Jay plays a solo acoustic set in Oâ€™Byrneâ€™s Pub in Edmonton, then we head for St. Albert for a two-night stand at the Castle Rock Pub. There, Iâ€™ve updated my blog! Is everybody happy now? Both of the bands I’m in are performing on Saturday, Feb. 10 at Steamers Pub. Jay Dunphy and the Religion and Annie Nolan are playing with The Vacant Lot. Show starts at 10pm. In other news, I’m doing a presentation at work tomorrow for a bunch of important people. Wish me luck.